It has been so long since the day I updated my blog here lols. I was being lazy because most of photos and notes are all updated on facebook. However, facebook has been locked in infinite time in Viet Nam [yes, and I am not sure why would they do such things?] I did unlock facebook and continue using it [THEY all know they cannot keep us away from facebook] but it’s running slower than before >.< So depressing!!!! So I decided to move my little home to here, WordPress, to continue sharing my thoughts, my photos and my everything. I have an album on facebook named “Baking baking” where I post my entire baking journey up 🙂 I’m an amateur but I never stop practicing so my baking skill definitely is improving quickly 😀 *yay* It’s gonna take a long time to move the whole album from facebook to wordpress >< but I’ll finish it soon. Today is a nice day in Viet Nam. And I feel content 🙂 I’m gonna introduce my cookies baked last night and formed by a tool called cookie press that I just got from my sister in USA. 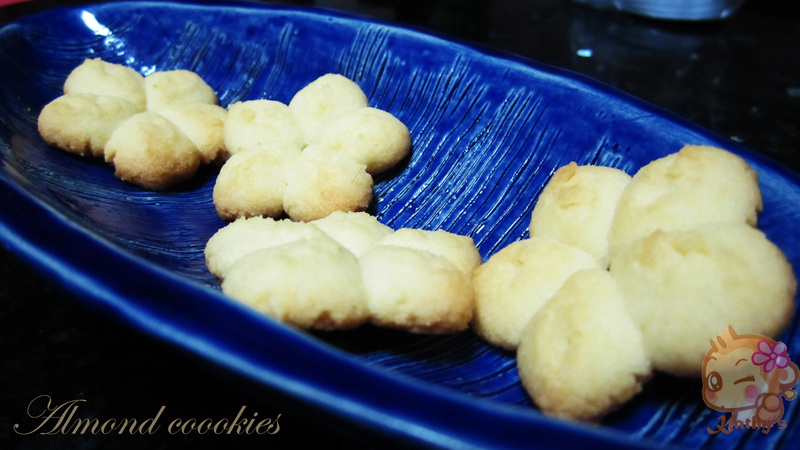 The cookies smell really really good ^___^ thanks to almond powder. According to the recipe, the amount of sugar is over 100g, which is quite too much for a person like me to take >< I reduced it to 90g and found it the best flavor. The cookies are not too sweet, thus, highlight the smell that cookies should have 🙂 yum!!! I myself love love love almond so much so this cookie is def my fav 🙂 What about you?